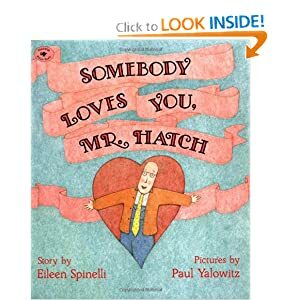 My favorite Valentine's Day read is "Somebody Loves You, Mr. Hatch" by Eileen Spinelli. The story was written in such a way that it is both simple and full of depth. The illustrations complement the story so well that I cannot imagine the story without them. "Mr. Hatch was tall and thin and he did not smile." The story continues by describing his daily schedule, which never varies and is dull and grey. The illustrations that accompany this first part of the story are done in washed-out and grey tones which reflects the lack of color and light in his life. (The character very much reminds me of Harold Crick in Stranger than Fiction, a delightful movie). One day, Mr. Hatch receives an unexpected package from the postman. He opens the box to find a heart-shaped box of candy and a simple note attached: Somebody Loves You. This small thing, a simple unexpected gift, makes Mr. Hatch smile. From here, color seeps into the pages of the book and Mr. Hatch's life. I won't give away the ending of the book. But suffice to say, it will give you that 'warm fuzzy feeling' that Valentine's day is all about. I'm going to try to find this book at the library for my little ones. I know they would enjoy it. This reminds me that one small gesture can truly make an impact in the lives of others. I wrote about kindness a few months ago-not that you would have time for a read like that (especially with little ones), but you are welcome to take a peek if you'd like. P.S. I love your blog, Mia. You have a new follower.